It's not hard to tell when you've walked into a room, or a house, in which a person is sick with with a flu or a bad cold. There's an immediate smell of stale sweat, cough medicine, and human misery. But can it be done with other diseases? According to doctors, there are some diseases, physical and mental, that can be identified by scent. I once read a novel in which one character assures the other that a certain odor is "the smell of schizophrenia." I thought it was an antiquated opinion, or perhaps an artistic invention, but it turns out that schizophrenia is one of a handful of medical conditions that humans can detect by scent. It's not surprising that people smell different when they're sick. Apart from the way behavior is modified - like lounging in bed all day - body chemistry changes. A person who is producing gallons of infected mucus can't possibly smell like they do when they're healthy. But some things give off specific scents that can be used in diagnosis. Schizophrenia doesn't immediately come to mind as a condition associated with a scent, because it is considered a mental disorder (albeit one rooted in the physiology and chemistry of the brain). However, schizophrenia is also associated with a different metabolism, that causes people with it to have a slightly different scent. Rats, trained with a reward system, were able to single out sweat from schizophrenic patients from sweat from non-schizophrenic people. Those with schizophrenia had a component called trans-3-methyl-2 hexenoic acid. The scent has been described as very sweet, like fruit that has over-ripened. It's not just sweat that changes scent, but breath as well. Cystic fibrosis patients have breath that is said to be slightly acidic. Asthma as well. Lung conditions are often given away through breath, but so are diseases of the liver, kidneys, and digestion. The gas that comes out of our lungs has been carried by the blood going through our body. Since the liver and kidneys are, in part, responsible for cleaning the blood, if they partially shut down, our blood perfumes our breath with different components. Untreated diabetics often have breath that smells like rotten apples. Liver and kidney diseases can make breath smell fishy. There's even a disorder called fish odor syndrome that happens when a body can't digest choline in food and builds up a chemical called trimethylamine. People who have worked in clinics that treat outbreaks of specific diseases have been able to characterize smells. Diptheria has a sweet odor, they say. Typhoid patients smell more like baking bread. One form of tuberculosis makes people smell a bit like beer. And young children who have a metabolic disorder that causes them to process a certain amino acid improperly smell so much like maple syrup (even their earwax) that it is called maple syrup disease. 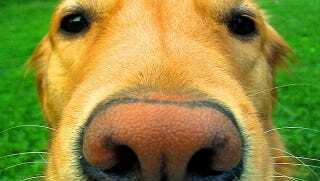 What humans can't smell, other animals often can. Service dogs are used to alert diabetics when their blood sugar changes and they are about to have a seizure. Dogs have also been known to lick or bite at certain parts of their owner's skin that turned out to be melanoma. (When melanoma is bad enough, researchers say it smells to humans like gasoline.) There is some talk of using dogs as early-detection sensors for some forms of cancer, but it may take people some time to accept the idea. For now, it's amazing how much we can sense about a person with just our noses. Via NCBI, The Economist, Minnesota Medicine, Scientific American, and Wired.